We were discussing the various assumptions made in the theory of simple bending, Thermal stress in composite bars, Centroid and centre of gravity and Elasticity and elastic limit in our previous posts. Now we are going further to start a new topic i.e. 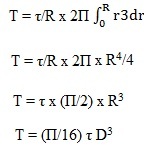 Maximum torque transmitted by a circular solid shaft with the help of this post. We recommend to first review the recent post “Torsion or twisting moment” for having basic information about the concept of torsion or twisting moment. So,what is torsion or twisting moment? We will discuss here one case of circular shaft which will be subjected to torsion and we will secure here the expression for maximum torque transmitted by a circular solid shaft. 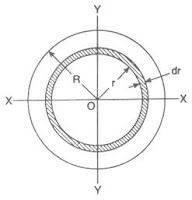 We will now discuss the another topic, Torque transmitted by a hollow circular shaft, in the category of strength of material, in our next post.